In the first week of our Engineering Unit, we studied Towers – stacking one block on top of another block to build something tall. 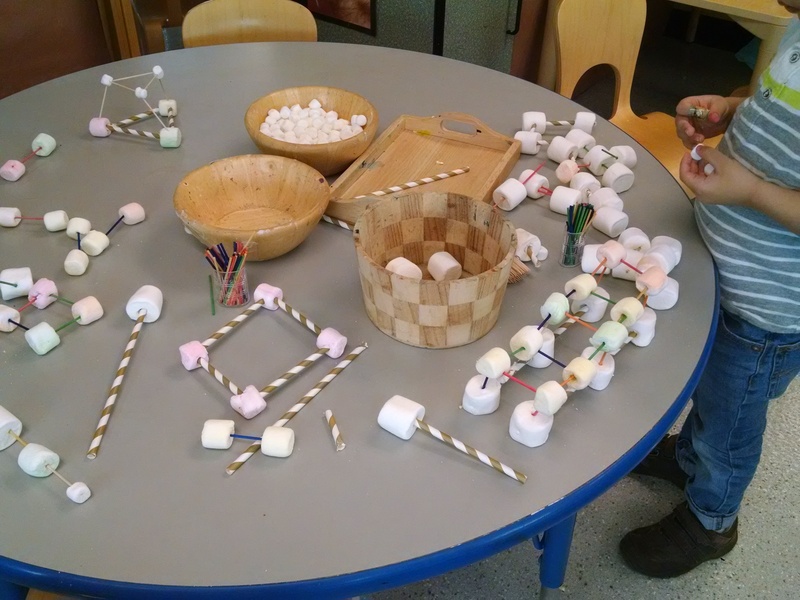 This week, we looked more at other more complex structures. 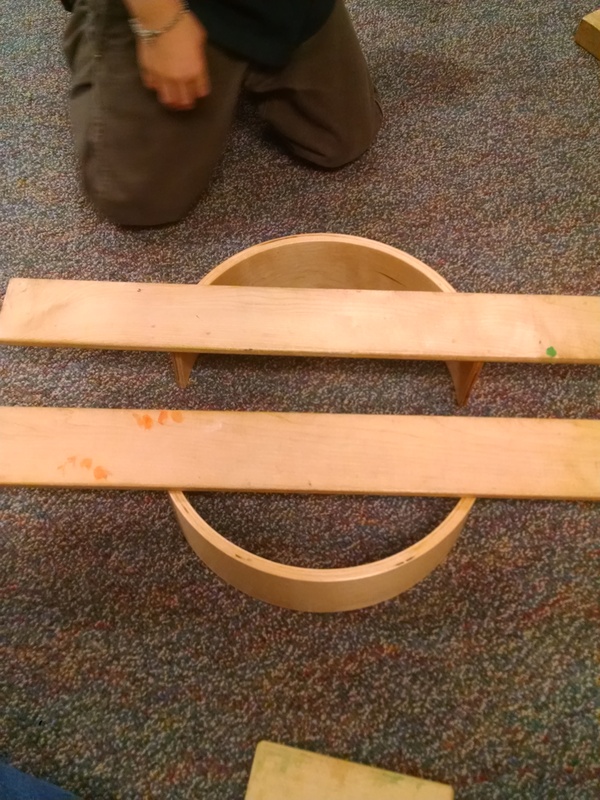 We played with bridges, tunnels, beaver dams and more. 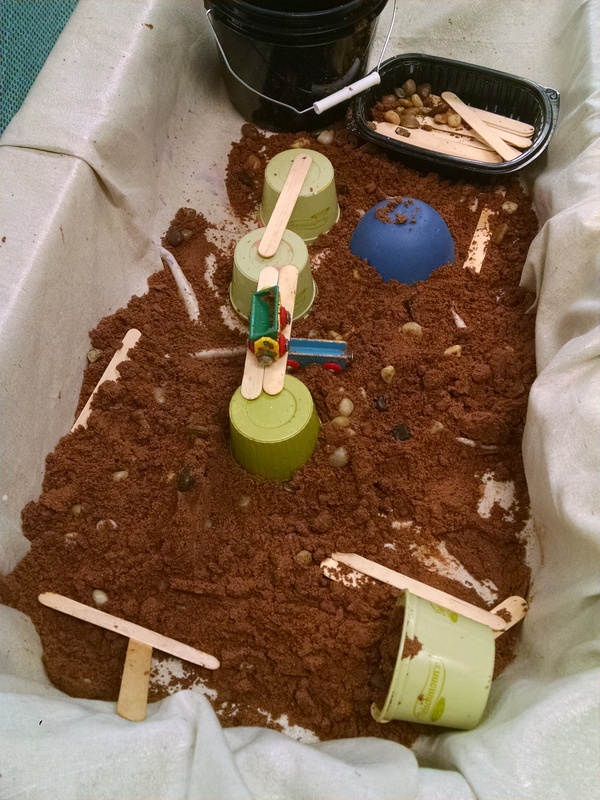 Tunnels and Bridges in the Sensory Tub. We made a cloud dough with flour, cocoa powder and vegetable oil. It smells good, it’s somewhat moldable (like kinetic sand), it looks like dirt, and it won’t hurt you if you eat it. 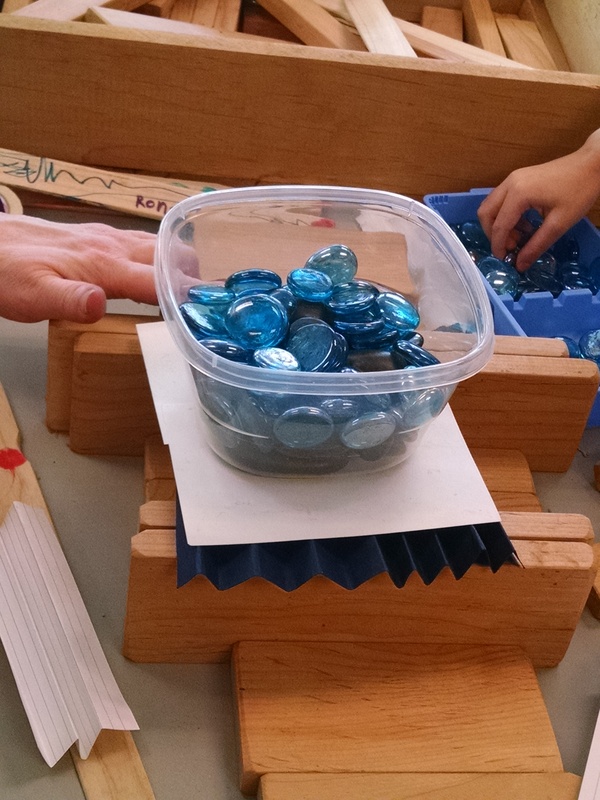 We placed it in the tub with rocks, dishes, and tongue depressors, so children could build bridges and tunnels. Next time, we’ll do an illustration to hang next to it of how to do a basic cut and cover tunnel – dig a trench, then cover it over with the tongue depressors. 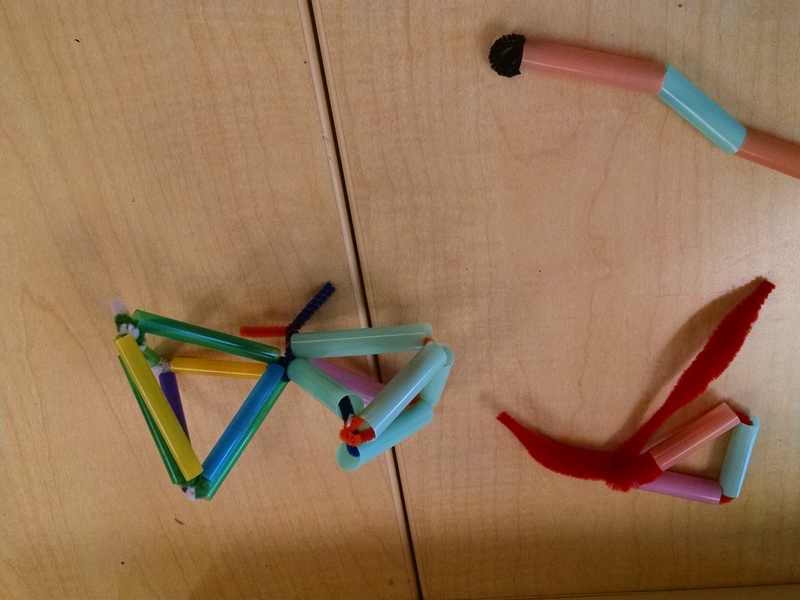 Pipe cleaners and straws: Kids could thread pipe cleaners through cut up straws, and then bend into various structures. Igloos. 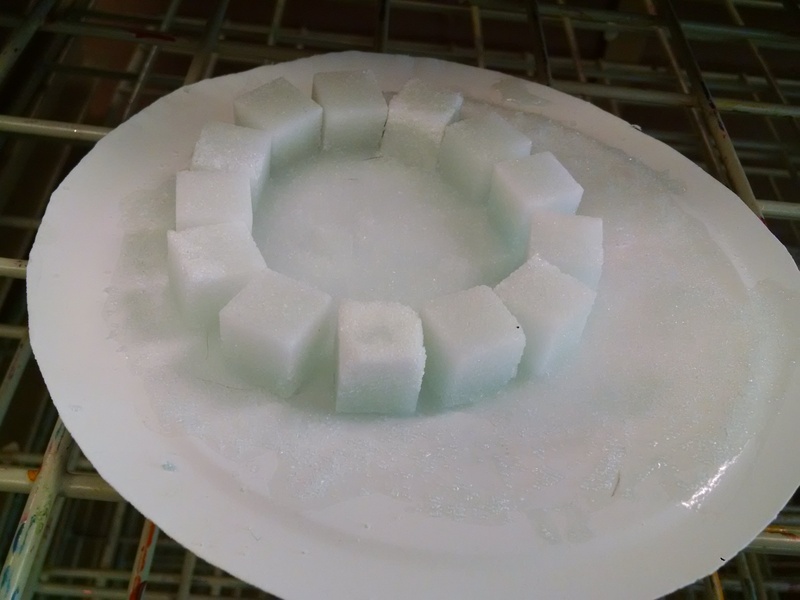 We built igloos with sugar cubes and glue. Here’s the beginning of one. Place a good illustration of igloo building next to this for guidance. For next year, we’re planning spring semester as a Biology / Inventions unit, where we talk about things from nature and biology and also talk about how that inspires human builders and inventors. 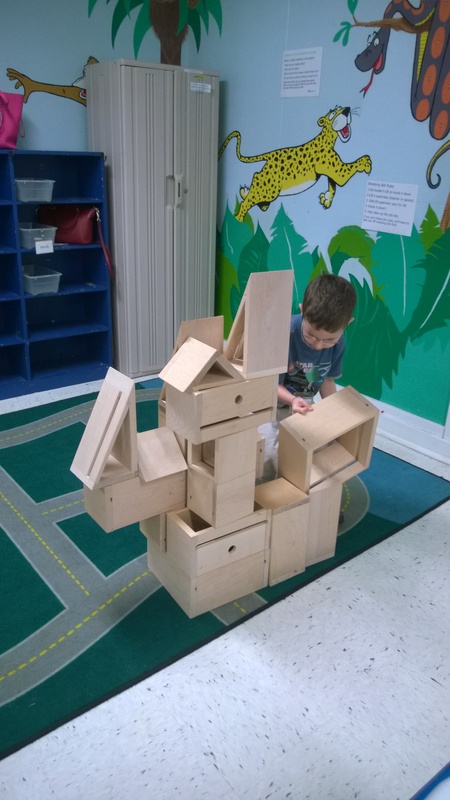 This week, we brought in the idea of an animal that builds structures. 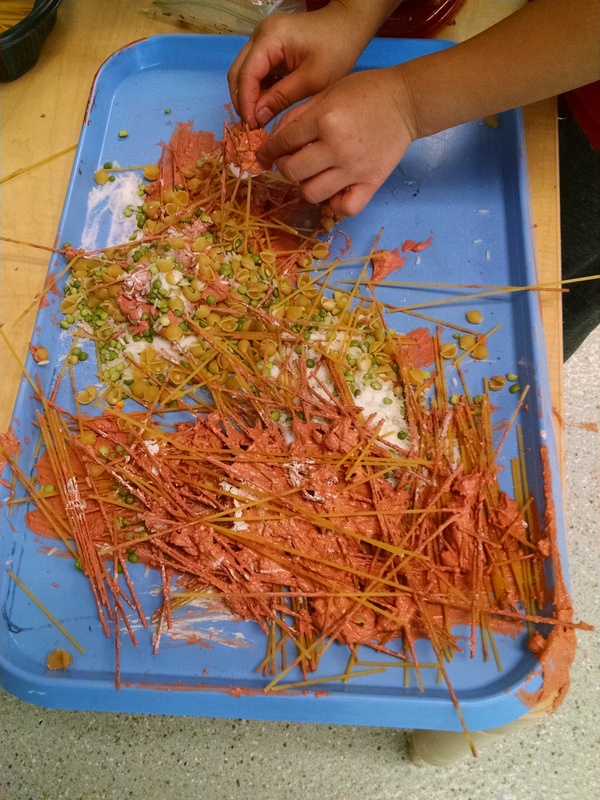 Build a beaver dam: We put out paste (glue and flour mixed), spaghetti sticks, and “pebbles” for kids to sculpt a beaver lodge or beaver dam. We had an illustration of a beaver dam nearby. 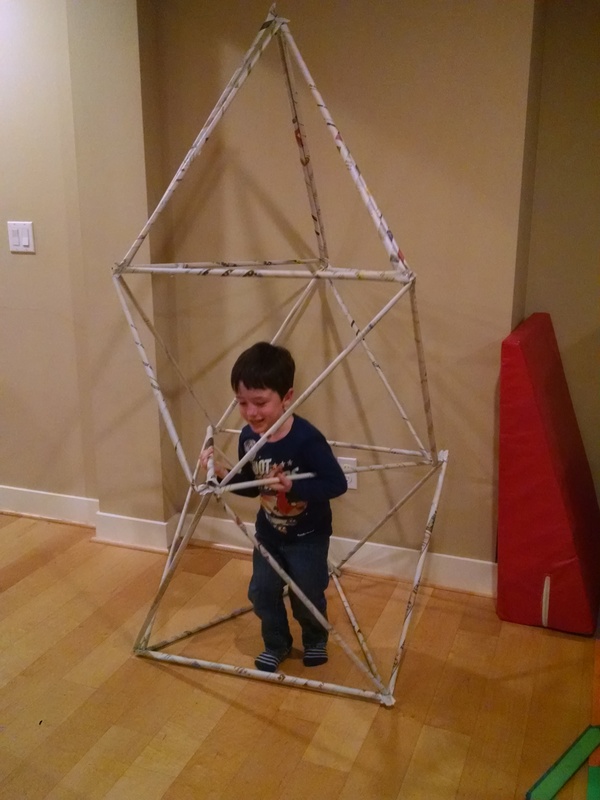 Months ago, I’d found a blog post on Modern Parents, Messy Kids that showed how to build what they called “Life Size Building Blocks” – triangular trusses made from newspaper. I’ve been looking forward to this ever since. 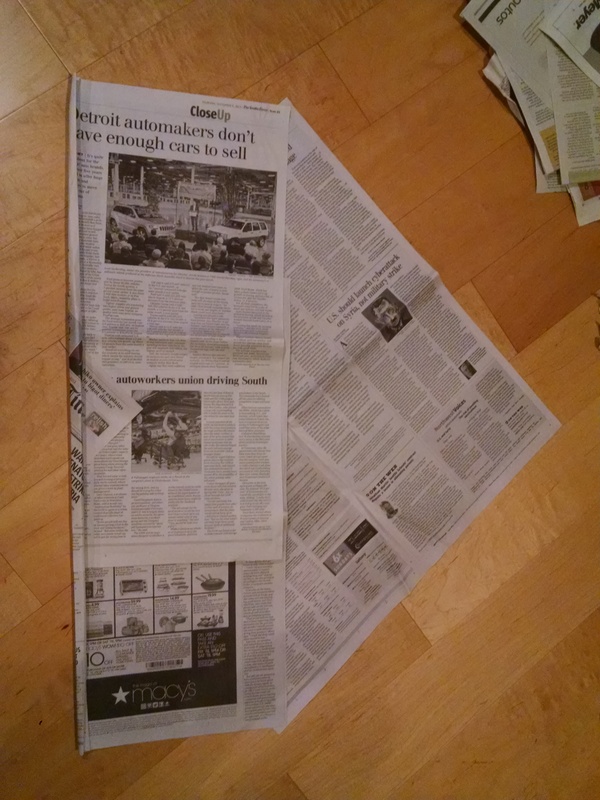 To make the paper tubes, they recommend “Take two sheets of newspaper, lay them out flat and start rolling it from one corner.” The advantage of this method is it’s quick and easy, and you need just one little square of tape to fasten each one. 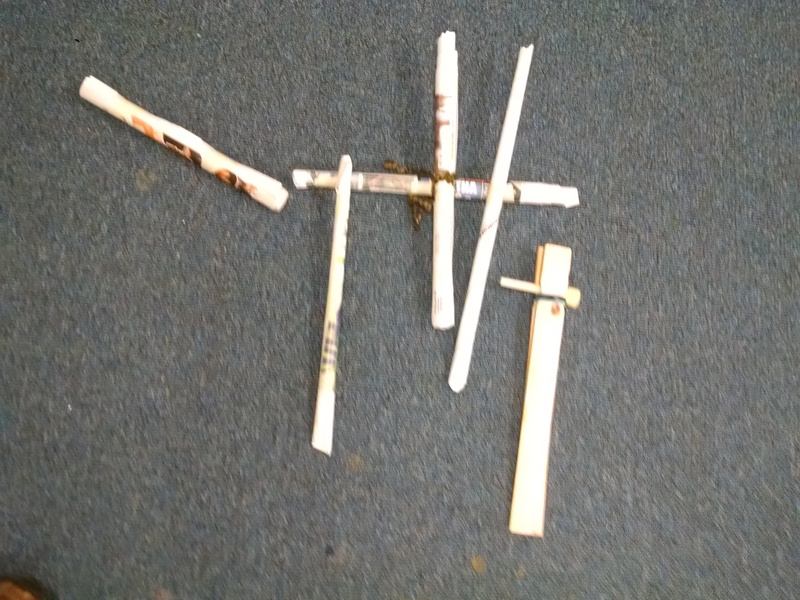 Their 7 and 9 year old were able to roll these by themselves. 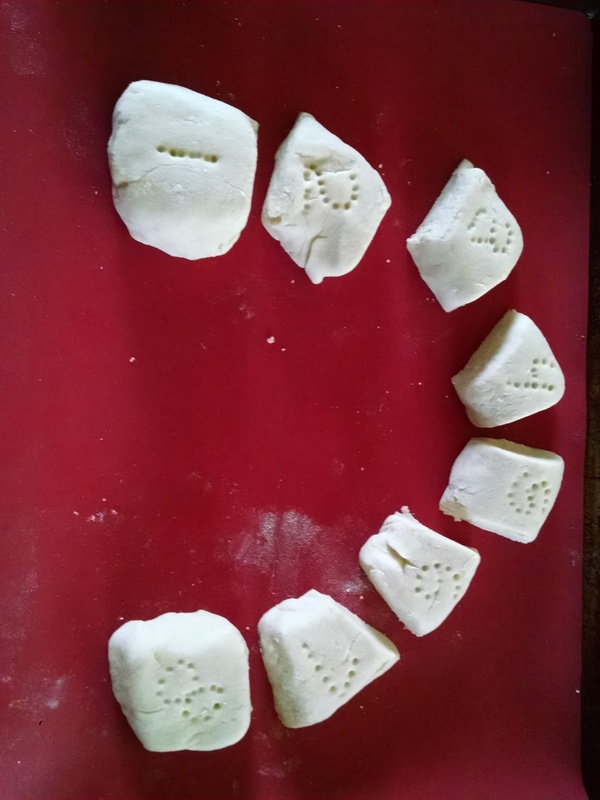 When I made mine, I made 45 (enough for 15 triangles) in the time it took us to watch Kung Fu Panda. But – the ends of these are very thin – that means they’re easy to staple together, but they also are weak and floppy and can collapse in on themselves. So, my husband developed a new method. 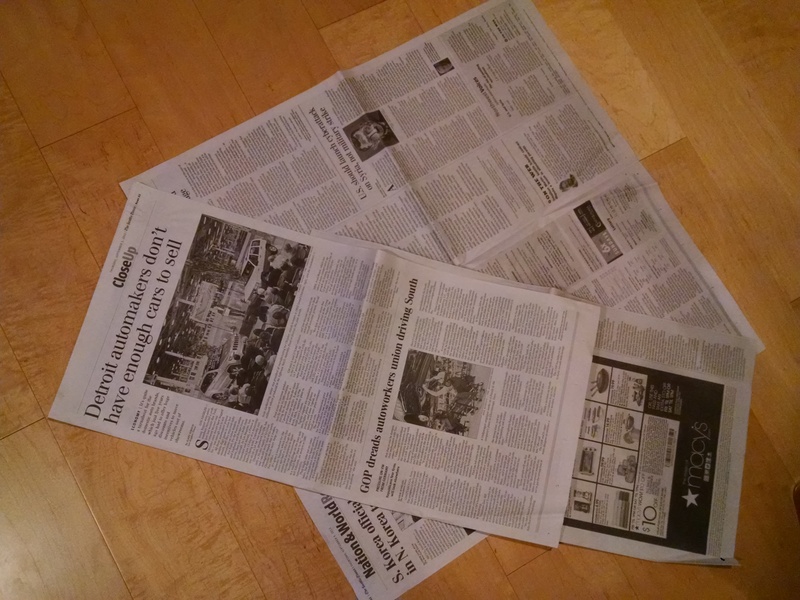 Take two pieces of paper, and off-set them a bit. 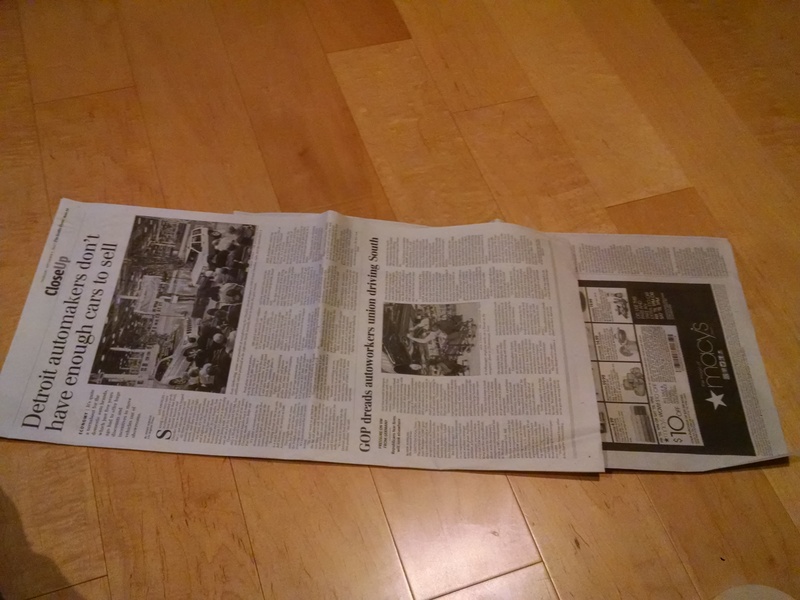 Then lay those two diagonally across a third. Roll from there. This results in ends that are still thin enough to be stapled, but sturdier than the basic method. Big blocks. 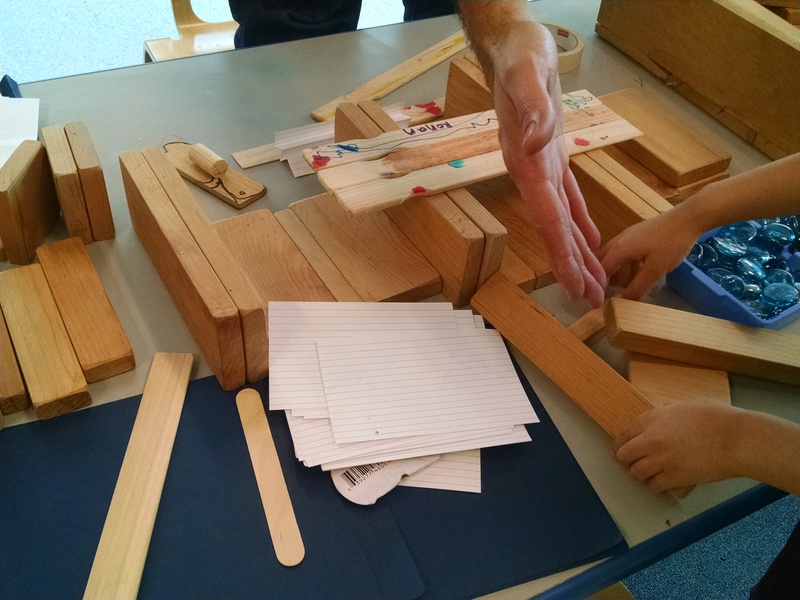 It’s just fun to build with really big blocks – these are heavy and moving them around feels like an accomplishment. 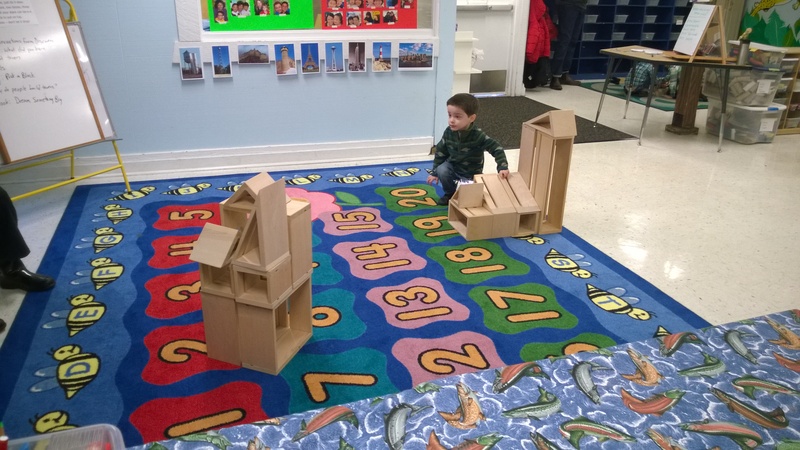 You have to warn the kids not to knock structures over and to be very careful when building up, because these blocks are really heavy and really hurt if a corner of one falls on your toes! What shape holds the most weight: Take four pieces of paper. Fold one in half to make a tent. 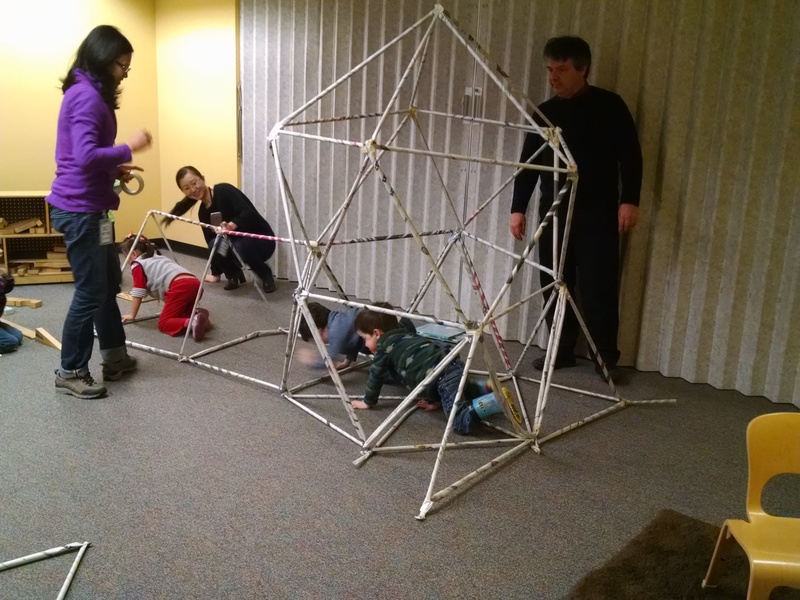 Fold one into a triangle tower, one into a squat square, and one into a round column. 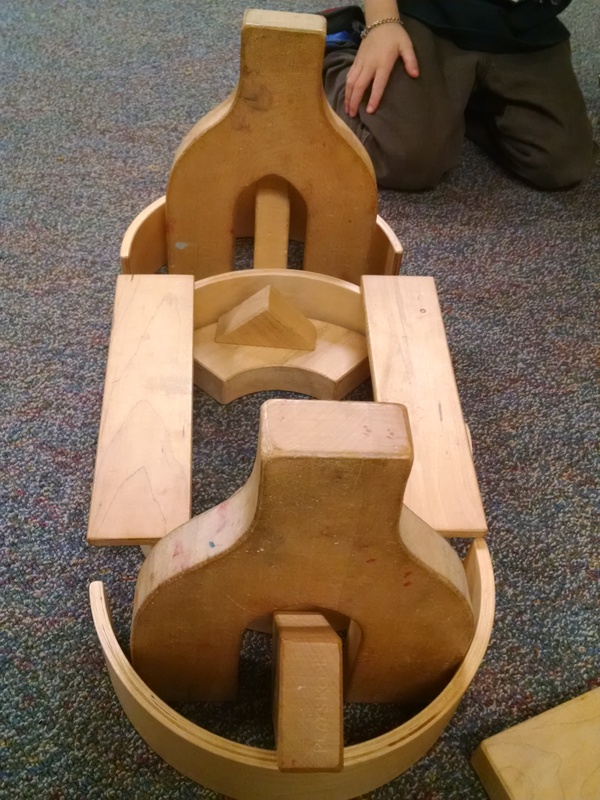 Ask your child which will hold the most weight, then test them. Watch this video from PBS’ Zoom to see this demo in action, except… they use a heavy book each time which crushes three out of four shapes. I would start with a thin lightweight book, which would crush the tent, but maybe not the triangle or the square. Then test the heavier book on that shape – it will crush it. Then test light book on round column, then heavy book. 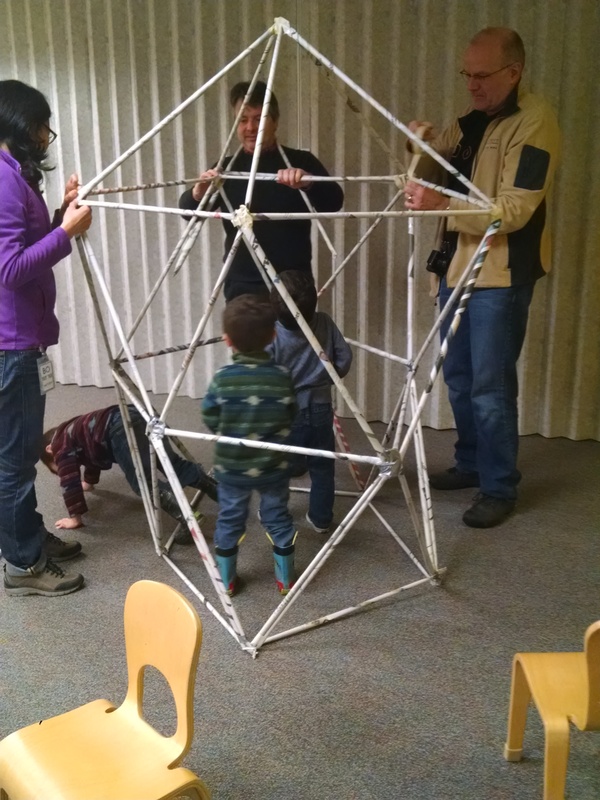 We did this with newspaper, and then ended by showing them a truss made of newspaper, and pointing at the structure we had made using trusses. 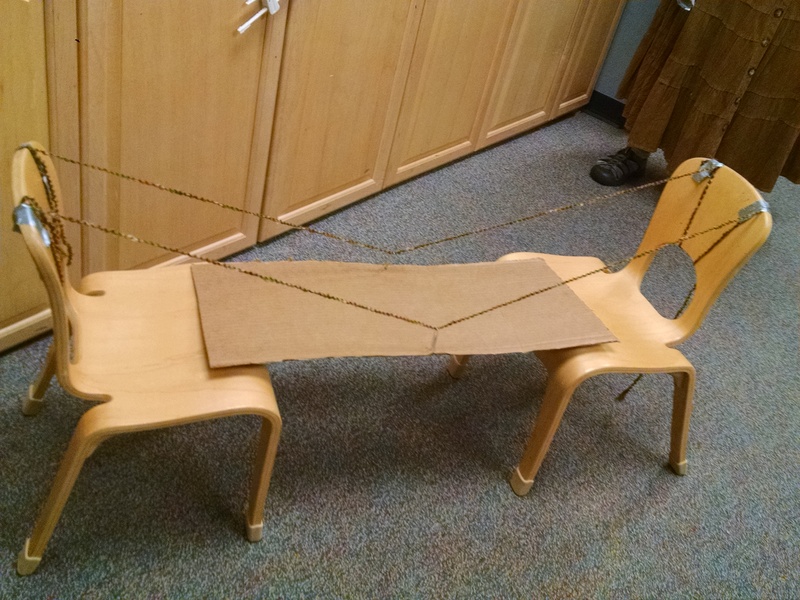 Suspension bridge: We demo’ed a suspension bridge, built with a cardboard deck, string, and paper clips. 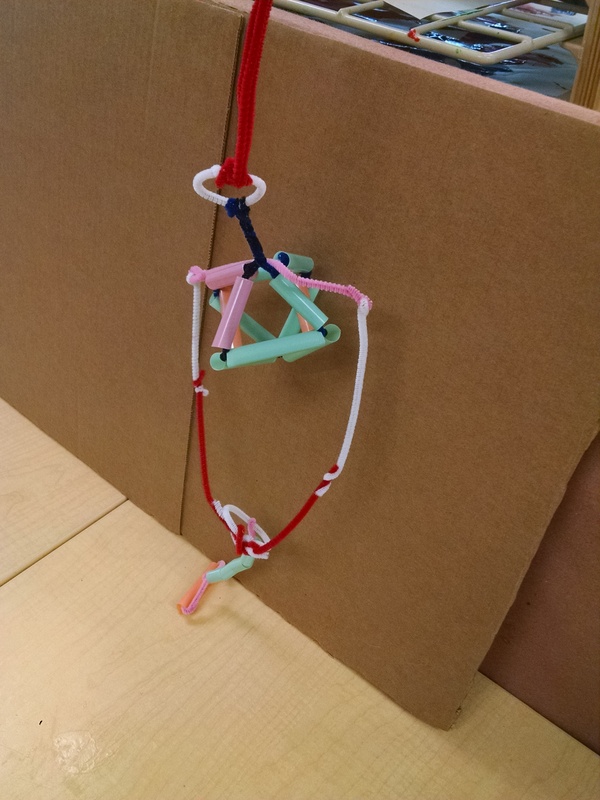 If you’re working with 10 – 12 year olds, try this suspension bridge project. We’ll see if it will hold the weight. Books and more songs: In opening circle, we read Iggy Peck, Architect , which is a delightful story of a boy who likes to build, who is discouraged by his teacher, until he saves the day by guiding his class in building a suspension bridge from shoelaces, fruit roll-ups and things. At closing circle, we demonstrated the basic idea of a draw bridge (using our suspension bridge model), then read The Bridge Is Up! which is a nice cumulative read-along for three to six year olds about all the vehicles who have to wait while the draw bridge is up. Then we taught them the rhyme Zoom Down the Freeway. (the lyrics on this page and the hand motions are the same we use, but I say it as a rhyme instead of singing it to the tune he uses.) Many of the parents and kids learned this rhyme in our toddler class, and recognized it from there. 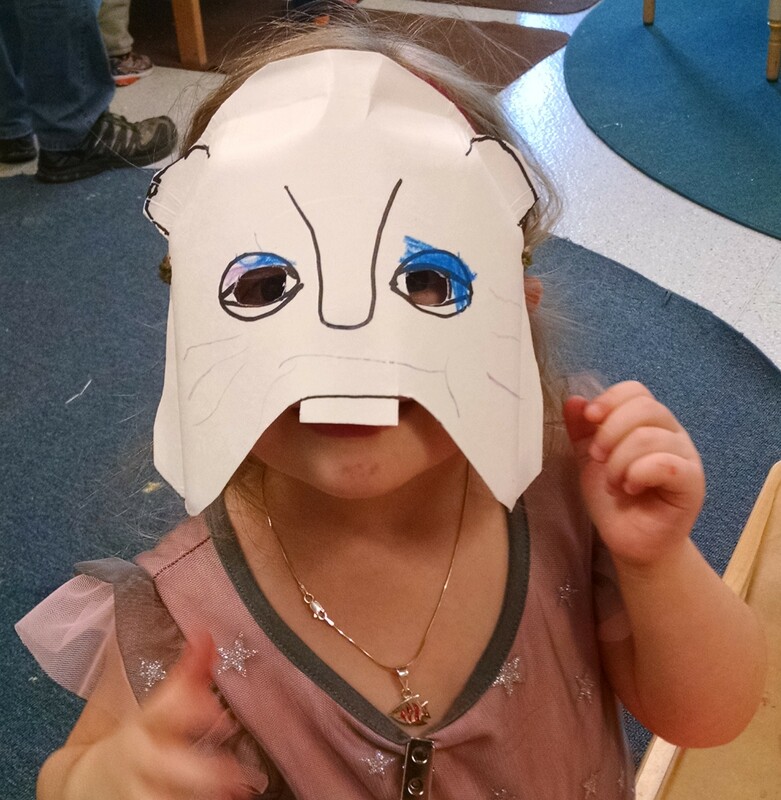 Creation Station: We have an area stocked with tape, glue, and lots of recycled and found materials where kids can always work to create anything they want. The oldest child in our class (who just turned 8) often does fabulous stuff over there. 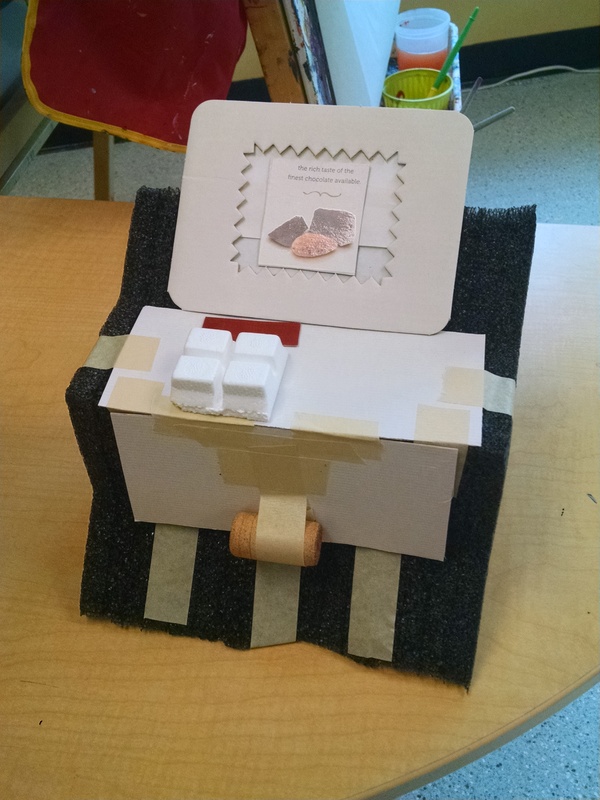 This week’s creation: a U-Scan checkout like you find at the grocery store. 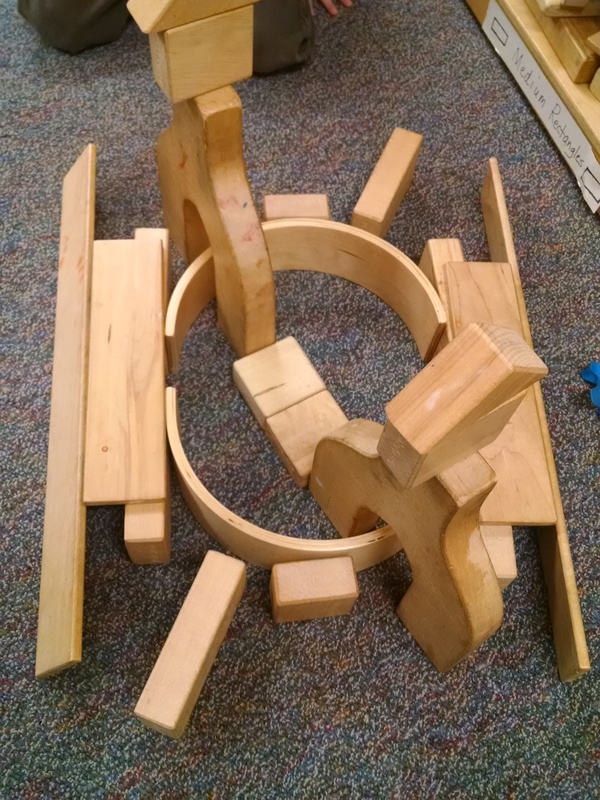 Symmetry Game: One of our 6 year olds was playing with blocks, and I noticed he was setting up a symmetrical arrangement. 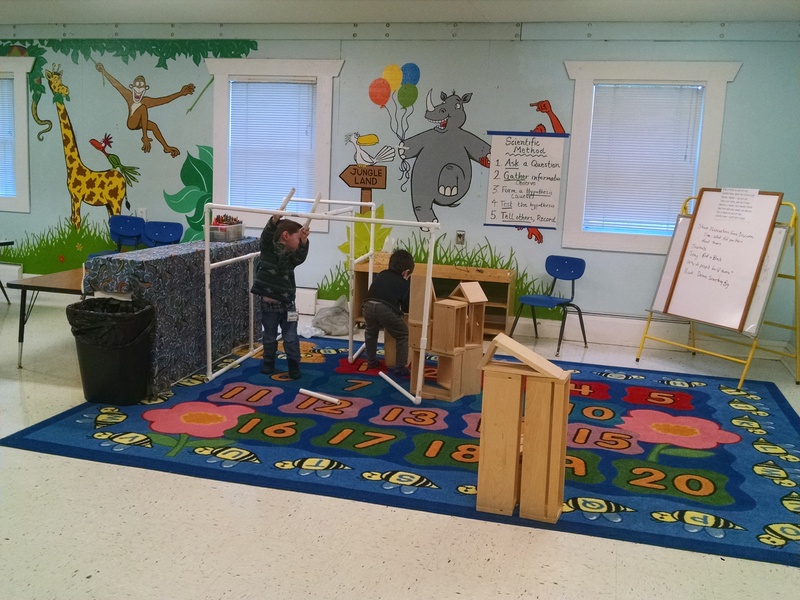 PVC pipes: At one of our classrooms, we have a collection of PVC pipes and joints that allow kids to build a variety of structures. Animal Tunnels: You could offer pictures of various animal tunnels and burrows: prairie dogs, rabbits, ants, and so on. You could also create a worm habitat and watch it for several weeks to see the tunnels develop. Cross a bridge is a nice age appropriate and engaging non-fiction about bridges.